The Mountain Pine Beetle (MPB), which is the size of a grain of rice, has destroyed more than 18 million hectares of lodgepole pine forest in British Columbia (an area more than five times larger than Vancouver Island). A few years ago, the MPB epidemic crossed the Rocky Mountains, triggering concerns of a Canada-wide epidemic. genomics.entrepreneurship@UBC recently sat down with Dr. Chris Keeling, a research associate working on the Genome Canada, Genome BC, and Genome Alberta-funded Tria Project led by Dr. Jörg Bohlmann (Michael Smith Laboratories, University of British Columbia) and Dr. Janice Cooke (University of Alberta). Chris is a lead author of the recently published “Draft genome of the mountain pine beetle, Dendroctonus ponderosae Hopkins, a major forest pest“ in Genome Biology. Having been part of the team to sequence the mountain pine beetle genome, we asked Chris to explain more about the specific dangers posed by the beetle and the role of genomics in pest-management. Why is the Mountain Pine Beetle Such a Huge Concern? The mountain pine beetle range extends from British Columbia down to New Mexico, USA. In BC, there has been a “perfect storm” for the mountain pine beetle to create large-scale destruction, with warming climate and forests comprised largely of lodgepole pine at the right age to be susceptible to attack. Also, there is no effective or environmentally-safe way to control the MPB with pesticides, as the beetles only emerge from under the bark of the tree once a year for a brief time in order to fly to another tree, and available pesticides would also affect other insect species. In the current epidemic, the beetle has moved across the Rocky Mountains, which were long believed to pose an insurmountable geographical barrier. Dr. Keeling acknowledged a couple of key factors behind this spread. In addition to the fact that the BC population of mountain pine beetles has grown to such an extent that they can now get over the Rockies in sufficient numbers to establish themselves, Dr. Keeling also suggests that this movement has been facilitated by the beetle’s ability to adapt to new environments. Having made it through half of Alberta, the beetle is now approaching Saskatchewan. 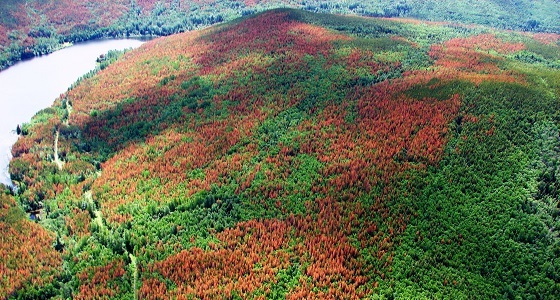 While foresters in Alberta has been vigilant in identifying the attacked trees and destroying those trees hosting beetles, huge areas of forest have already been attacked, and there is growing concern that the epidemic will spread into the boreal forest, containing Jack pine, which extends into Atlantic Canada. Research has already shown that the mountain pine beetle can survive and reproduce in Jack pine, and if the beetle makes it into the much larger boreal forest, controlling the epidemic would become much harder. Tria, which means “three” in Greek and Latin, derives its name from three different types of organisms of the mountain pine beetle system: the bark beetle, the fungi and other microorganisms associated with the beetle, and the host pine trees. The multiple interactions between these organisms as well as their interactions with the environment are at the heart of understanding the mountain pine beetle epidemic. While healthy trees have strong natural defenses against pests, for example in the form of oleoresin released when beetles chew on the trees, these defenses can be exhausted when beetles attack in large numbers. To overwhelm this defense, beetles form a pheromone-mediated “mass attack,” attracting ever-more beetles by releasing pheromones upon landing on a tree, breaking down the trees’ defenses before they have a chance to have an impact. An infestation density of approximately 40-60 beetles per square metre of bark surface is sufficient to kill a tree. The beetles chew holes in the tree’s bark to enter the tree, and introduce fungi that are carried in the beetles’ mouthparts. As these fungi grow into the trees’ bark and wood tissues, they can block the water and nutrient transport system of the tree. Some fungi are able to digest the tree’s tissues, which might deliver nitrogen to the beetles, while other fungi may detoxify tree defenses and help protect the beetle. Some of the fungi associated with mountain pine beetle produce a blue pigment which gives the characteristic “denim” stain of beetle killed pine wood. The members of the Tria team who contributed to the genome sequence of the mountain pine beetle included researchers led by Dr. Steven Jones at the Michael Smith Genome Sciences Centre, as well as researchers at the University of Northern British Columbia and the University of Alberta. Sequencing the mountain pine beetle genome was initiated with a Steacie Fellowship of the Natural Science and Engineering Council (NSERC) to Dr. Bohlmann and a seed project led by Dr. Jones and supported by the BC Ministry of Forests. The genome sequence was completed in the Tria Project. The team in fact sequenced two genomes: one of a male pupa; and another of the female adult. The male pupa was chosen because the insect voids its guts before pupating so it is the cleanest, having less tree tissue, bacteria or fungi to contaminate the sample. The researchers also wanted to choose an insect from the same log or one close by the same larva, but with only female adults available, the choice was essentially made for them. This approach was partly a consequence of the decision to sample beetles from the wild rather than producing them through inbreeding, and by taking an organism that has not previously been inbred, the project acted as a proof-of-concept for the Michael Smith Genome Sciences Centre. While inbreeding will reduce genetic variations and simplify sequencing and assembly, it requires 10 to 15 generations of inbreeding to reduce the variability of the genes. In the case of the mountain pine beetle, which has a generation time of about a year, it would have taken ten years of inbreeding and we would have lost out on a timely access to this genome information in the meantime. Having this sequence information facilitates studies into the evolution of insects and comparative analysis between other organisms. Knowing the mountain pine beetle genome also makes it easier to study the genomes and other features of closely related beetles. Dr. Keeling mentioned there are many species in the Dendroctonus genus, of which MPB belongs. Many of the beetles in this group are pests, such as the spruce beetle and southern pine beetle. The transcriptome (expressed genes) of the southern pine beetle has already been sequenced and can be compared with the mountain pine beetle to determine how these genes differ and how has mountain pine beetle adapted to a different environment than the southern pine beetle. The European spruce bark beetle, a significant pest in Europe, belongs to the Ips genus, but may be another candidate to have its genome sequenced in the near future. This study allows some key questions to be addressed, such as the respective roles of the beetle and the fungi in generating pheromones by detoxifying the same tree compound. While not a current research focus, Dr. Keeling also found a bacterial gene within the mountain pine beetle’s genome. This transfer of genes, known as “horizontal gene transfer,” is not uncommon between bacteria (such as antibacterial resistance genes), but it is rarer between bacteria and insects. In bacteria, this gene is known to metabolize sugars, but its role in the beetle has yet to be determined. What Dr. Keeling does know is that the gene is “being expressed in the right place to do its job” – in the digestive tissue of the beetle. Understanding the biology of the mountain pine beetle is vital to managing its impact. Much of the beetle’s biology is already known from a large body of previous entomological and ecological studies. The sequence of the mountain pine beetle’s genome gives researchers and forest pest managers additional new tools to understand how these insects operate in interactions with trees, fungi and the environment. For example, Tria researchers can now look for genetic similarities, variability and mutations in populations of the beetle across the landscape of the epidemic in BC and Alberta to learn how the beetles are adapting to different environments. In essence, with a genome sequence in hand, we can now test if there are differences in the genetic makeup of a beetle population in the aggressive phase of an epidemic compared to the genetic makeup of harmless (endemic) populations. Such differences may identify genes that are essential for the beetle to transition into the epidemic phase, and such genetic information may become useful for diagnostic or prognostic applications. Of course, all of the genetic and genomic information needs to be interpreted in the context of the ecology of the beetle in its environment. Dr. Keeling believes that forest pest genomics is also becoming an increasingly important tool in predicting impacts of other insect pests under conditions of climate change. The cost of genome sequencing has been dramatically decreasing in recent years. This decreased cost and increased speed of sequencing will result in the sequencing of many of the economically and ecologically important pests which cause damage to forests and agriculture. Dr. Keeling is a Research Associate in Dr. Jörg Bohlmann’s lab in the Michael Smith Laboratories at the University of British Columbia. He has always been interested in nature and plant-insect interactions and has worked with mountain pine beetles, spruce beetles, pine weevils, and honeybees in his undergraduate and PhD studies. His post-doc research in the US involved genomics of different bark beetles. He is studying plant-insect interactions, and adopting the tools and ideas of genomics into chemical ecology research. For more information, please contact Dr. Chris Keeling at ckeeling@msl.ubc.ca or visit his website at cikeeling.wordpress.com. This study was funded by Genome BC, Genome Alberta, Genome Canada, NSERC, and the BC Ministry of Forestry, and is part of The Tria Project: Mountain Pine Beetle System Genomics, an interdisciplinary, collaborative research project led by Jörg Bohlmann (UBC) and Janice Cooke (University of Alberta) to study many aspects of the beetle, associated fungi, and the tree. For more information, visit the Tria website. Since announcing the sequencing of the MPB, the Tria project has generated considerable media interest and coverage. Read or watch some of the media stories below.